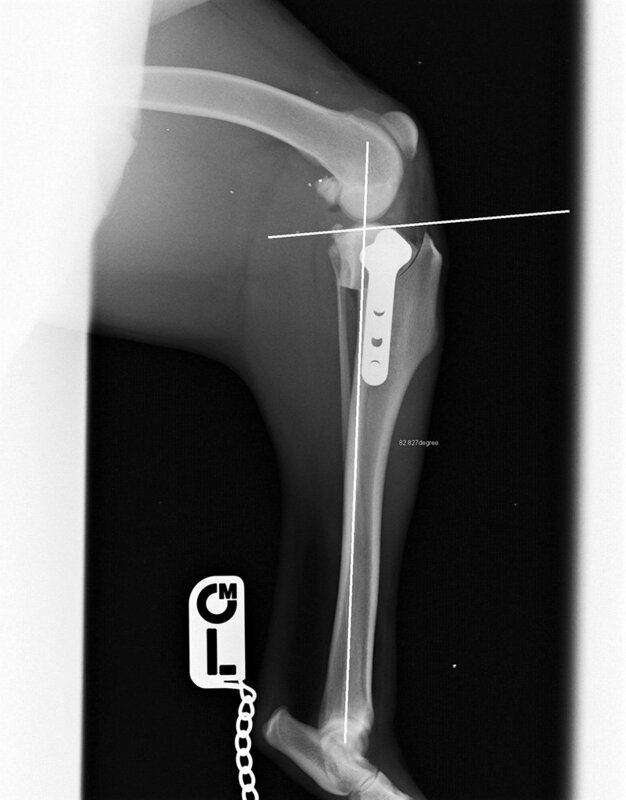 TPLO stands for Tibial Plateau Levelling Osteotomy. It is a surgery for dogs that have snapped a ligament in their knee (stifle), called the cranial cruciate ligament (CCL). The CCL is a band of tough fibrous tissue within the joint. It is commonly torn in humans during sporting activities such as football. In dogs the CCL usually ruptures after it has degenerated and weakened (causes largely unknown) and it is often a normal force acting on a diseased ligament that results in the injury. Dogs walk on their tip toes (compared to humans) and this results in the CCL being under tension during normal walking and running. The tendency is for the bottom end of the thigh bone (femur) to slide down the top of the shin bone resulting in stretching and pain in the stifle joint. TPLO surgery changes the angle of this slope eliminating this tendency. The top of the shin bone is angled forwards by making a circular cut in the bone, rotating it and applying a metal plate to hold the top section in the new position until it heals. There are different surgeries available to treat a ruptured CCL and the most appropriate procedure will depend mainly on the weight of the dog, but age, activity level, conformation and surgeon experience and preference are often also important considerations, as are owner finances. Alternative procedures might include TTA (tibial tuberosity advancement) or even a “lateral suture”. TPLO surgery is the procedure of choice of many specialist orthopaedic surgeons for most cases of CCL rupture, especially for heavier dogs (over 30kg). Smaller dogs, under about 15kg, can often recover with just pain relief medicine and time but the recovery is often slow and incomplete, and the joint is likely to develop arthritis earlier and more severely than after an effective surgical procedure. For large dogs, lameness, often severe, is very likely to persist permanently without an operation. There is a high chance of the CCL rupturing in the other leg (about 40% within two years) resulting in very severe immobility if the original leg has not been treated affectively. Without treatment dogs are likely to require lifelong anti-inflammatory treatment. The aim of TPLO surgery is to leave the patient sound (not lame) without restricting exercise and without the need for pain relief medicine. This is achieved in 95% of patients without any complications. The joint is left “dynamically stable” meaning there is no stretching when the dog is running or walking. Complication of TPLO surgery are rare but possible and include bleeding and infection around the metal plate. Infections can be managed with antibiotics and plate removal after the bone has healed in the majority of cases with a good long term outcome. Some dogs will go on to injury a cartilage within the joint (“late meniscal injury”) which can be treated inexpensively and is not truly a complication of the surgery but a consequence of some residual instability in the stifle. CCL rupture affects some breeds much more than others though any breed can be affected. Labradors, Rottweilers and Boxers are very over-represented whereas whippets, lurchers and greyhounds are almost never affected. At the time of writing, and as a guide, the procedure is priced at £2,800 including follow-up x-rays at 6-8 weeks after the operation.